UFC flyweight champion, Henry Cejudo, is devoid of any idea regarding the future of the 125-pound division. Cejudo spoke with MMAJunkie this past week, amidst a regular UFC 234 promotional activity, and also revealed that as per him, Demetrious Johnson has a hand to play in the gloomy situation of the of the flyweights. On January 20th, 2019, the main event at UFC Fight Night 143, scheduled for Brooklyn, featured a highly-anticipated contest. The current UFC bantamweight champion, T. J. Dillashaw, shed a few extra pounds, subsequently accepting Henry Cejudo's open challenge at UFC 227. The pair were slated to compete in what was widely believed to possibly be the last fight in the flyweight division. The massive build-up to the bout translated into a rather bizarre anticlimax when an early 32-second stoppage saw Henry Cejudo as the winner of the fight. Although the clash for gold came to a disappointing end, the UFC is currently in works for a mega-fight between the two, only this time, most probably at a hundred and thirty-five pounds. 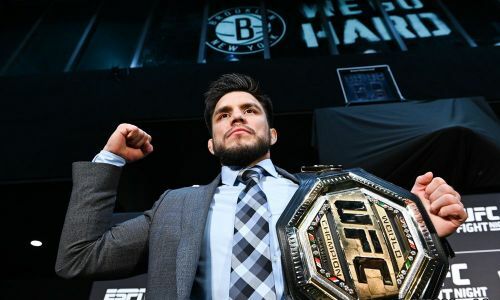 Cejudo also insisted on a connection between the current situation of the flyweight category, to the low-key nature of the division's previous champion, Demetrious Johnson. Cejudo said that Johnson was not 'vocal' and could have been more 'flamboyant' in his approach with the business. Presently champion and voice of the flyweights, Henry Cejudo, seems to be making the most of his recent trajectory in popularity. WWE superstar, Nikki Bella, was seen calling Cejudo out after the champion's recent triumph over T. J.Dillashaw at UFC Brooklyn. Will Cejudo's association with Nikka Bella bring in WWE fans to watch over and save the flyweight division? Leave your thoughts, opinions, and predictions in the comments section below!